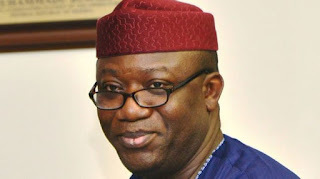 The governorship candidate of the All Progressives Congress in Ekiti State, Dr. Kayode Fayemi, has expressed great joy over his victory in the Saturday’s primary election. DAILY POST reports that Fayemi polled 941 votes to beat Oni, who polled 481 votes in the rescheduled Ekiti State APC primary election, which held on Saturday. He said, “I am delighted to have won the party’s primary election, and I am also happy because the delegates voted for me. “It shows that they believe so much in my abilities to change the lives of the Ekiti people to better compare with what they are currently experiencing. Addressing Ekiti indigenes, Fayemi stated that he was not on a vengeance mission against the government of Governor Fayose but had unfinished business in terms of bringing more development to the state. He, however, pleaded with them to forgive any of his past policies, which may have offended them while serving as governor of the state.